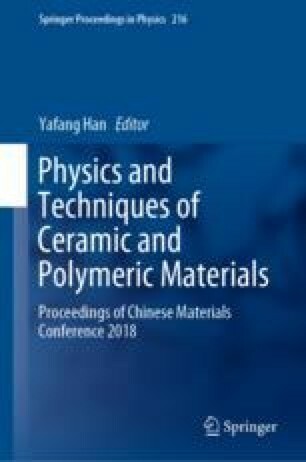 In this paper, aluminum/niobium co-doped calcium copper titanate ceramics were synthesized by a dry route based on the chemical formula of CaCu3Ti4−xAl0.5xNb0.5xO12 with x = 0.0, 0.2, 0.5, and 5.0%. The dielectric constants of the ceramics were over 104. X-ray diffraction and scanning electron microscopy results show the high dielectric constant comes from the capacitance effect of inner barrier layers (IBLC). In order to explore the origin of the semiconducting grains in it, X-ray photoelectron spectroscopy (XPS) was used. The experimental results show the existence of Ti3+ ions in sample, which caused the lattice polaronic distortion and the formation of Ti3+–O–Ti4+ bonds. Under the applied electric field, the polaron can be transported from a Ti3+–O–Ti4+ bonds to another, which leads to the generation of dc conduction. The existence of Ti3+ ion results in the semiconducting of grains in aluminum/niobium co-doped calcium copper titanate ceramics. The formation process of Ti3+ ion was also discussed.